Friends: As with any major sporting event the Tour de France has amassed a vast reservoir of statistics during its century of existence, enough to give any gathering of bicycle racing fans material to debate and recount and marvel over for hours. And since the different route every year is as much a part of the race as the racers, there are as many statistics relating to the route as to its participants and their heroics. There are stats and related trivia on every mountain the peloton has climbed--the Tourmalet was one of the first included in The Tour and has been climbed more than any other mountain, even twice one year, once from each direction. There have been more than 500 Ville Etapes with ten new ones this year, more than usual. The longest Tour was 5,745 kilometers in 1926, compared to 3,500 this year. The total distance of all 95 editions (there were none during the two world wars) is 350,000 kilometers. One statistic I haven't uncovered, though I'm sure its out there somewhere, is the number of miles of plane trees each Tour has biked past and the total number of plane tress included in each year's route. Today's route through Provence could have set a record, as much of the first half of this 122-mile stage was blessed by the shade and shelter of those magnificent trees that line many of the roads all over France, through towns and cities and out in the countryside. Many date to the Napoleonic era. It is said Napoleon planted the trees to make it cooler and shadier for his marching troops. We bicyclists enjoy them equally, appreciating not only their practical use but their regal beauty as well. One feels almost triumphant passing under the arcade of shade they provide for miles and miles. Unfortunately, they didn't line the entire route today. I would have greatly welcomed them towards the end of the day's stage, when the day had heated up into the 90s. I was down to less than one bottle of very tepid water as I began the day's final climb, ten miles from the stage finish, as the sun beat down with a vengeance. Then a minor miracle. Just short of the summit I saw what I first took to be a mirage--a van slowly driving along dispensing two-liter bottles of water to the fans. I wasn't desperate, but I happily grabbed a bottle and partook of a few gulps of the sweet, fresh, cool water, expressing silent thanks to the great consideration of the race organizers. They truly are attentive to the most minor of details to make it a superlative experience for all. There is always water passed out to the fans lining the last kilometer of the course, to keep them there for the TV cameras if nothing else, but still a significantly caring gesture, something I've never experienced in the bleachers of a baseball game. I was very nervous about making it to Digne-les-Baines before the course was closed down today. Having to cover 85 miles by two p.m. would demand my biggest effort so far. Plus the last 60 miles were a gradual ascent from 600 feet elevation to over 2,000 feet as we approached the Alps, somewhat like the gradual climb across the plains of the U.S. to Denver. There was no early tailwind today, as I've enjoyed the past few days. I was only averaging 12 mph, which meant seven hours in the saddle for me. Since I had started at seven a.m., that left no time for a break. After an hour a group of 20 men, all but two wearing identical jerseys of some Australian corporation, flew past me at 20 mph. I recognized one of the two guys wearing the non-matching jerseys from years past, as he was a guide for the Australian tour company Bike Style and was wearing the company jersey. We've chatted before, but today he was too engrossed in being a guide to even acknowledge me with a "how ya doin' mate." I could understand, as he wouldn't want his clients learning that one could be doing this on their own for a pittance of what they were coughing up. Despite their speed, I was able to latch on to their pace line and stuck with them for ten miles or so until we hit a steep climb. There were two over-sized guys at the back, who I thought might struggle enough that I'd be able to hang on, but even though they lagged, they didn't lag enough. I let them go rather than kill myself to keep up. About an hour later along came Jesse the Texan and Skippy the Australian. Turns out I have seen Skippy in the past and not only at The Tour but also at the Dauphine-Libere race. 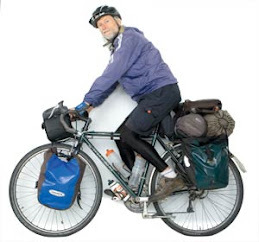 He's an older white-bearded guy, tall and grizzled with a bit of a paunch accentuated by the Lycra jerseys he wears. I had assumed was Italian, as he bore all the earmarks of the tifosi, not only in his dress and his high-quality carbon fiber bike, but also that he is a groupie of a sort, hanging out around the team cars before and after stages. He rode with Jesse and I for a spell and then forged on ahead, pushing a big gear rather than spinning. We caught up to him as he stood beside a camper drinking a glass of wine. Jesse said he seems to know everyone following The Tour. He rode along with us some more and then took off. Again we passed him sipping a drink and talking with some folks. The next time he caught us he urged Jesse to speed it up and to latch on to his wheel so they could finish off the stage in time to start heading to the next one. My two drafting sessions with the mini-Aussie peloton and then with Jesse and Skippy increased my average speed to nearly 15 mph and the conversation kept me on my bike rather than pausing to eat or rest as I otherwise might have, though I now could afford to take a quick break. By the time I crossed the final pass, the road had been closed to all but bicyclists. Still, every flic I passed from the summit into town looked as if he were itching to step out and order me off my bike. Jesse said he rode with an Australian earlier in The Tour who just barged past them at full speed shouting "Aussie, Aussie" if they tried to stop him. I've beaten the peloton to the finish four straight days now, my best effort ever. Its always an exciting place to be and a good launch pad as soon the race finishes to start riding or heading towards the next day's stage. My string will end tomorrow as it is 60 miles from here to the start of tomorrow's stage in Ebrum, and those 60 miles include a couple of significant passes. I should arrive in Ebrum well before the day's start at 12:30. Ebrum is a first time Ville Etape, so it should be all gussied up. Rather than following the peloton into Italy, I'll head over to L'Alpe d'Huez, less than 100 miles away. There will be some tough climbs, but I won't have to push it as I have had to the past four days to reach the finish before the peloton. Now its back to the finish line here in Digne-les-Baines, which I scouted out as soon as I arrived in town. I was in time for the hand-out of water and the two newspapers. Then I went to the grocery store and stocked up on food for the next 24 hours. The next order of business, as usual, was a visit to the tourist office to find the best way out of town when the race finishes and where Internet could be found and to see what exhibits or displays they might have or know of in town celebrating The Tour's visit. Today's stage could well end in a sprint again. Cavendish will be going for his third straight win and fifth overall. He already holds the record for most stage wins by an Englishman in a single year and if this keeps up will have the career record soon too.